Babies naturally love to be read to for important reasons. Early reading strengthens a baby’s language skills, memory, sensory development, bonding and other essential developmental tasks. Some babies enjoy sitting still and listening closely and others prefer a more interactive experience. Reading is very important, but it can be confusing, at times, for parents and caregivers to know what to do and when and where to start. What should be expect from reading to babies in the first year-and-a-half of life? Which books are considered “good” books for babies? What reading practices should parents and caregivers use while reading to baby? Birth to 3 Months— Newborn babies are too small to pay attention closely to a story, however, they LOVE the sound of adult voices and benefit tremendously from hearing you speak. Rhythmic books with a simple cadence are a particular favorite for newborns, but even listening to you read the newspaper aloud does the trick. Newborns prefer simple illustrations with contrasting colors (black & white is a favorite). Primary and bold colors are fascinating too, while pastels (which moms and dads prefer to pick for their precious, sweet babies) are the least interesting. Parents are advised to focus on cuddling/bonding with their babies during reading. Human touch is an essential developmental need at the newborn phase. Reading time is the perfect point in the day (second to feeding) to focus on touch/skin-to-skin contact/cuddles, eye contact and speaking directly to baby. 3 Months to 6 Months— Babies in this phases have begun grasping and reaching with their hands and arms and are more aware of their senses. They want textured, fabric and plastic books for mouthing and touching independently. Board books, especially with texture, are ideal for a shared reading experience. Babies in this phase also like simple pictures with primary or bold colors. They prefer pictures of faces (especially of other babies), animals and familiar objects (favorite foods like an apple or pear, bath tub, toy, tree, etc…). Babies in this phase like to hear you read. They will want to study your lips and may try to mimic you with simple sounds (ooh, aah, goo, gaa, etc…). Rhythmic, rhyming books are a favorite. Parents are advised to read slowly, to point to pictures and say the words that correspond, to demonstrate touching textures and keep it short. Young babies have very limited attention spans. If your baby only wants to mouth books, offer plastic or fabric books or an alternate toy to hold/mouth during story time. Do not force a young baby to pay attention. Instead, follow their lead. What are they interested in? What does baby point at? There is no need to start at the beginning of the book and turn to every page. Think of the book as a conversation starter instead of a story. 6 Months to 1 Year– Babies begin to become interested in, or actually work to become mobile, in this phase. They begin to sit up, roll over, scoot, crawl, stand, cruise and may even walk! Movement and mobility is their focus and so it may be hard to get baby to sit for long and read. Use tired times (before and after naps and bedtime) to read. Movement is actually a crucial part of developing language skills. In fact, baby’s brains that are more dense in the movement regions in infancy develop better language skills more quickly and thoroughly in their childhood years. Do no inhibit movement. Take every reasonable opportunity to free baby from his seats and bouncers and put him on the floor to develop muscle tone and comfort with his own ability to move. The advice in the 3 month to 6 month section still applies for these babies. They will have a slightly larger attention span, but a greater desire and ability to explore and respond during reading time as well. Point, ask questions, respond, repeat and engage your baby during reading. Avoid quizzing them or providing negative feedback to their efforts to use their whole body during reading. Also, a wider variety of reading materials are interesting for babies in this stage. They are ready to branch out from the simple, contrasting colors and study more complex illustrations and photographs with a variety of colors. Choose books with simple text and themes, but look for beautiful, engaging pictures. 1 Year to 18 Months– If a baby hasn’t already, (barring any developmental delay) he will learn to walk by 18 months. A baby on the move can find and retrieve her own books now. Make sure books are accessible and that the covers are visible. See my article on book display and rotation to learn more. Babies in this phase will still mouth books, but are possibly able to learn to restrain the urge to mouth. If training baby to not mouth books is too difficult, wait a bit longer. It is important in this phase that baby learns to love books and not associate them with negative exchanges. Offer safe mouthing objects during reading, so that baby can focus on touching the books, cuddling, speaking and listening. Avoid pacifiers during reading as they inhibit speech. Advice on movement from the 6 month to 1 year section still applies. Promote movement and play as much as reasonably possible. Babies in this phase will also be readily developing the ability to speak complete words. 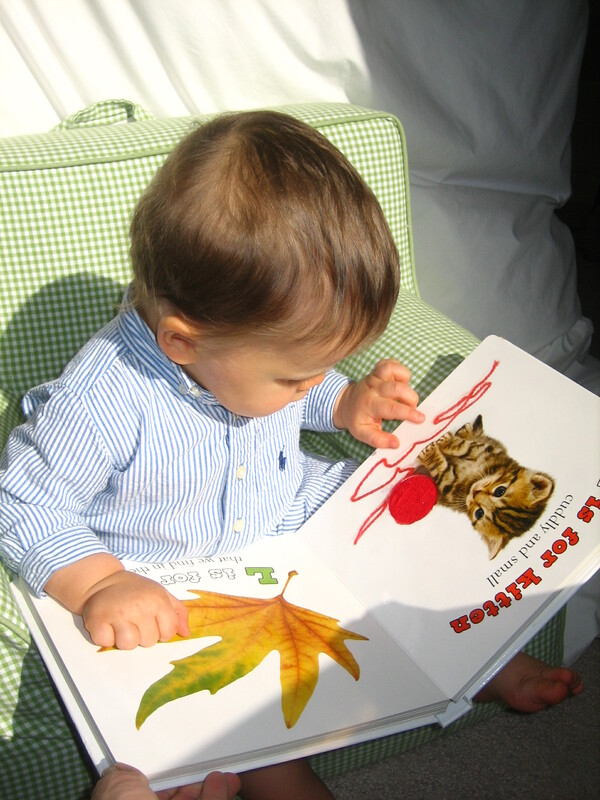 Choose books with words and themes that interest your baby and encourage them to speak. For instance, making a picture book with your family members is great fun for a baby in this phase. Baby is ready for more complex books and ready to learn colors, shapes, ABC and other basics. He may not be able to say or identify them, but he will be interested in books that focus on these themes. Again, avoid turning reading time into quizzing time. Memorization is not as important as complex thought. For example, understanding how to identify the same or similar objects that come in many varieties, shapes, colors and sizes requires a deep level of thinking while pointing at the same, familiar circle and saying “circle” only requires basic recognition/memorization. It is important in this phase to establish a regular reading time to build a precedent for regular reading as baby grows and schedules become more full. Start leaving out words as you read familiar books to baby and see if she can fill in the missing words. Not audibly responding does not mean that baby is not thinking. Reading does not need to be structured and books do not need to be read cover to cover. Focus on what interests baby and encourages them to speak. Babies in this phase also love books with flaps, just be careful to not leave them unattended with “flap” books as they will tear the flaps. This list is not intended to be comprehensive. Books suggested meet the criteria detailed in the article and have been tested and approved by The Intelligent Nest. When selecting books, pick themes that interest baby most and look for simple, clear text and pictures. Avoid cluttered illustrations and scattered text that lacks flow. Rhythm and rhyme are always preferred by babies and contribute to literacy and language skills.